Living on the northernmost tip of Cape Ann, overlooking Rockport’s Pigeon Cove, I have explored the local harbors, coves and headlands under all conditions – as well as the coast and islands of Maine. I’m mindful that these coastal views are the same that the early explorers saw, virtually unchanged for hundreds of years. Over time, Ray has explored the coast from Boston to Downeast Maine, under every conceivable condition and from land and, most often, from water. He has traveled the rugged coast of Maine north to Acadia, including many of the accessible islands along the way – and most recently has expanded his horizons southward to New York Harbor and the Hudson River Valley, with its unique visual beauty and rich maritime history. Ray′s maritime art is a natural extension of his earlier aviation art focusing on the golden age of air travel in America and the “ships of the air” that have changed transportation forever. 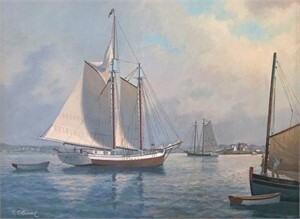 Maritime painting is as much a discipline as it is art for Ray, and he enjoys the research and study as much as painting the picture. Over the years, he has studied weather, astronomy, history, ship design and construction, and other specialties in order to produce paintings that are not only visually compelling, but also competent – reflecting knowledge of the subject and not just the paint. Ray′s work has been exhibited in museums and galleries throughout the United States, and is in the collection of the National Air & Space Museum, Cape Ann Museum and many private collections nationwide. His work has also appeared in books, magazines and calendars, and has won numerous awards. 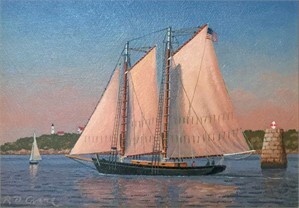 View Ray Crane's Paintings on our marketplace. 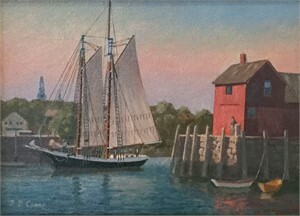 Ray Crane Painting with an historical perspective Living on the northernmost tip of Cape Ann, overlooking Rockport’s Pigeon Cove, I have explored the local harbors, coves and headlands under all conditions – as well as the coast and islands of Maine. I’m mindful that these coastal views are the same that the early explorers saw, virtually unchanged for hundreds of years. The natural beauty and drama of the land and seascapes, along with the extensive research I do, motivates me to create paintings with a historical perspective. My paintings connect with the past and serve as a reminder that, as much as things change, much remains the same. — Ray Crane A lifetime resident of Boston’s North Shore, Ray lives on Cape Ann, Mass., and finds inspiration in the scenes and history of the New England coast. 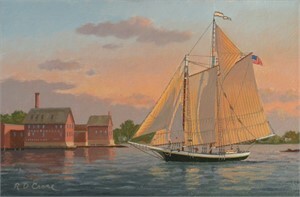 He focuses on the schooners and other vessels that figured prominently in New England maritime history. 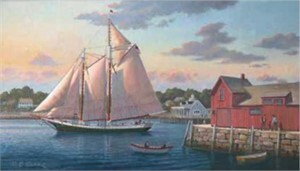 Life on this historic coast provides endless opportunities to observe vintage sailing vessels firsthand and visit the harbors and coves that have inspired American artists for more than 200 years. 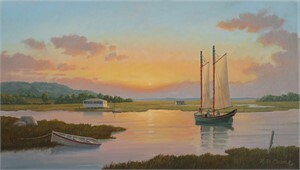 Exploring the locations witnessed by Heade, Lane, Salmon and Homer provides a live connection with the past and the inspiration to create new work that shows their world as it is today. Over time, Ray has explored the coast from Boston to Downeast Maine, under every conceivable condition and from land and, most often, from water. He has traveled the rugged coast of Maine north to Acadia, including many of the accessible islands along the way – and most recently has expanded his horizons southward to New York Harbor and the Hudson River Valley, with its unique visual beauty and rich maritime history. Ray′s maritime art is a natural extension of his earlier aviation art focusing on the golden age of air travel in America and the “ships of the air” that have changed transportation forever. When not painting or seeking new locations, Ray searches the archives of museums and libraries for information that will result in new works with a unique historical perspective. Maritime painting is as much a discipline as it is art for Ray, and he enjoys the research and study as much as painting the picture. Over the years, he has studied weather, astronomy, history, ship design and construction, and other specialties in order to produce paintings that are not only visually compelling, but also competent – reflecting knowledge of the subject and not just the paint. Using sunrises and sunsets, moonlight, approaching storms and other effects to evoke a mood, he hopes to instill a greater appreciation for the past and show the enduring influence of the past in our life today. Ray′s work has been exhibited in museums and galleries throughout the United States, and is in the collection of the National Air & Space Museum, Cape Ann Museum and many private collections nationwide. His work has also appeared in books, magazines and calendars, and has won numerous awards. 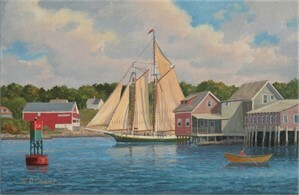 View Ray Crane's Paintings on our marketplace.